We go from boring, sideways trade to one of the most exciting days of the year. 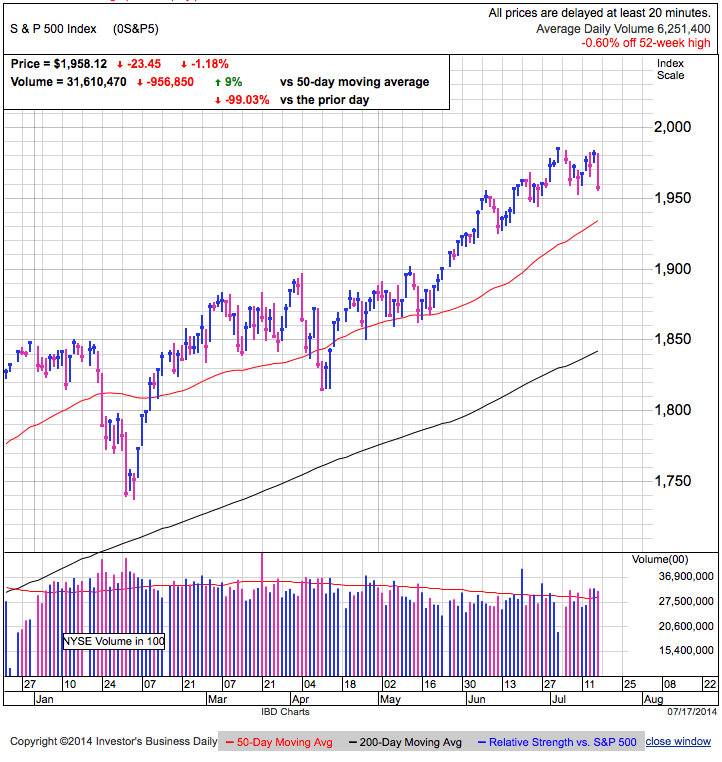 Today’s 2% decline was the fourth largest of the last 13-months and volume was off the charts as we smashed through prior support and the 50dma. They say a picture is worth a thousand words, so check out the adjacent chart. Today we plunged through support and finished at the lows of the day. Looking back over the last year, we can see multiple examples of similar dramatic crashes through support. The most noteworthy thing is each of these prior down-moves was the final gasps of a selloff. If we use history as a guide, today’s huge volume selloff could very well mean the worst is already behind us. Today’s move lower was a pain trade, plain and simple. We didn’t get blindsided by a shocking headline and most traders had a hard time pointing to the one thing that triggered this selloff. The best journalists and talking heads could come up with was recycling old headlines about taper, interest rates, Ukraine, sanctions, Israel, and Argentinian debt. There was nothing new today that hasn’t been talked about ad nauseam over the last few weeks and months, meaning today’s selloff wasn’t really being driven by these recycled headlines. What if the true root cause was simpler? What if today’s huge move was nothing more than normal market gyrations that got carried away? Breaking support sent technical traders running for cover and once they started selling, others followed their lead even though they didn’t know why they were selling. This is the herd mentality that was ingrained in our species by evolution. When everyone else in the clan started running, our ancestors started running too because anyone left standing around was about to become lunch. And so while no one could explain why the market sold off today, they sold alongside everyone else anyway. We all know the best trading opportunities come from going against the herd but it takes a lot of courage to buy when everyone else is selling. 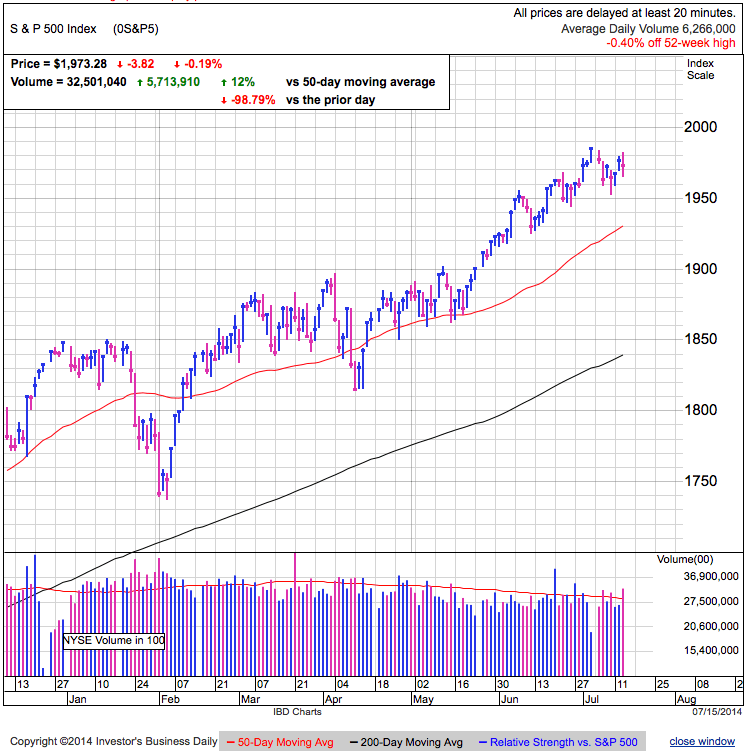 The market never found its footing today and finished at the lows of the day, but if we look back at previous pullbacks in this bull market, big down moves that broke support and finished at the bottom of the day’s range is fairly bullish. 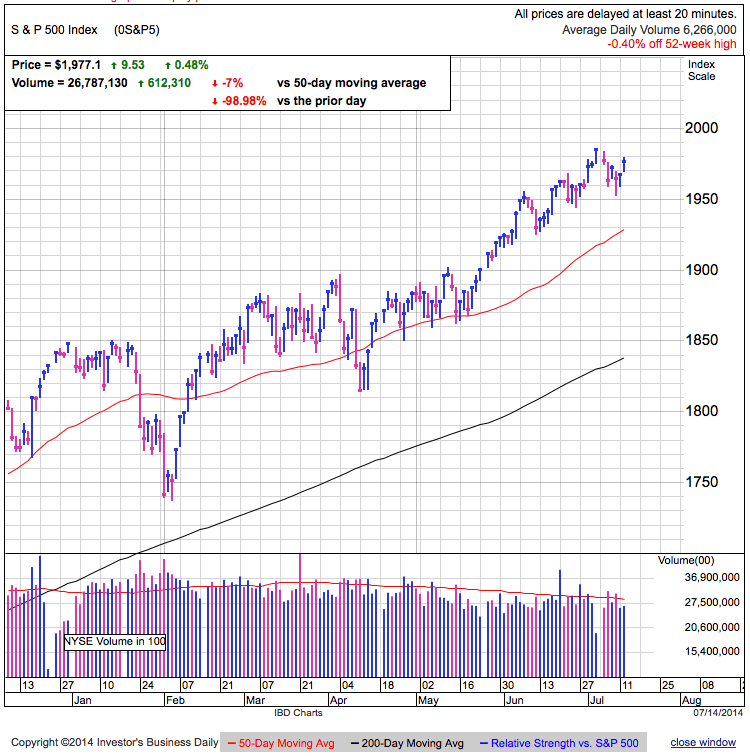 While we might dip under today’s low by a few points over the next few days, if the aggressive selling doesn’t continue on Friday, the worst is likely behind us. If it was too easy to buy the dip, then we haven’t found the bottom. Everyone knows this is a buy-the-dip market, but we also know this cannot go on forever. If we don’t find a bottom near Thursday’s lows, then we have to endure more pain before this is over. If we find support Friday, the selloff is dead and everyone should buy the dip. If we crash another 20-points in early trade, get out of the way because this thing will keep on going. While we have the monthly employment report Friday, the market will largely trade the direction it wants to go regardless of report shows. A fairly dramatic day. We gapped higher at the open on stronger than expected GDP numbers, but sold off minutes later and tested 1,960 support. The Fed rescued us midday with a rosy outlook, but those gains also failed to stick. For as much as we moved around, we ended almost exactly where we started. Volume was the highest in a month as many traders reacted to every headline and gyrations. It was an interesting session with two energetic upside moves that failed to stick. It’s hard to hang a bullish hat on that kind of performance, but can we infer we are on the verge of collapse? Not yet. All today’s price-action tells us is those with cash didn’t want to chase these bullish headlines. While that limits our upside potential in the near-term, it is the other side of the house that determines if we keep declining. Right now the market’s fate rests in owners’ hands. Do they sell at a discount or do they assume we’ll bounce like every other time over the last year-and-a-half and keep holding? A lot of people are throwing the complacency term around like it is a negative thing, but complacent owners don’t sell and it is really hard to get a correction started without supply. So far this price-action looks like a vanilla Buy-The-F’n-Dip. Of course with every BTFD, the challenge is figuring out when we’ve bottomed. Given today’s weak follow-on buying, it doesn’t feel like we’ve reached the bottom yet. 1,960 is technical support and often the market likes to fool us by violating support before turning around and going the other direction. If we breakthrough 1,960 but the selling stalls shortly after, that gives us an interesting entry point. Every dip, correction, or crash is buyable, the only question is how long to wait before jumping in. While most of the recent dips were buyable within days, we will eventually find ourselves faced with a longer and deeper dip. Nothing shatters confidence and complacency like seeing everyone else rush for the exits. Wait for the selling to stop before buying any dip. Don’t be surprised if we slip under 1,960 in coming days. But if the selling stalls shortly after, bears should consider locking in profits and bulls can buy-the-dip. On the other hand, if selling accelerates and we blow through 1,950, hang on because the next stop is 1,930 and 1,900 if that one fails to hold. Stocks continued yesterday’s rebound in early trade, but stumbled midday and sold off into the close on elevated volume. 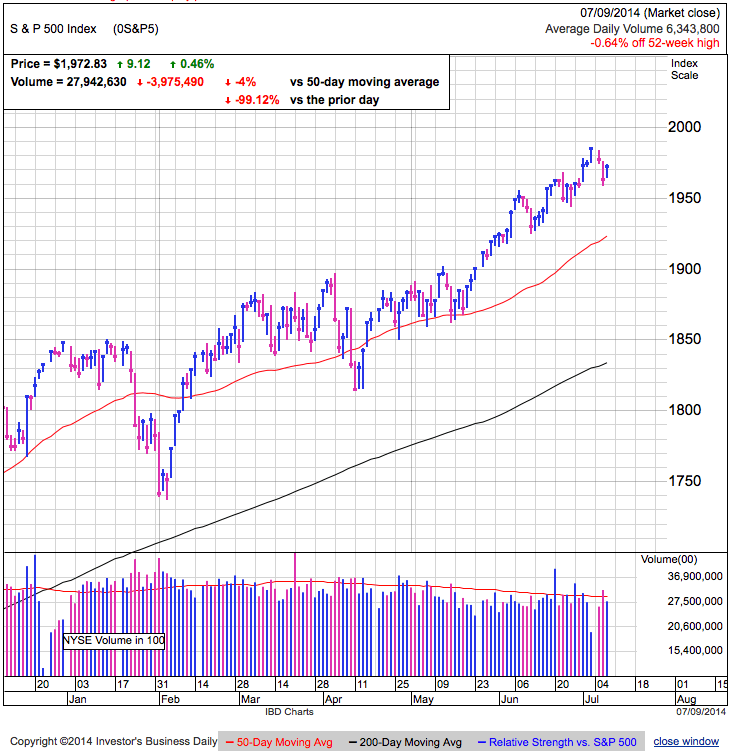 The market held Monday’s lows and remains comfortably above 1,960 support. Talking heads attribute Tuesday’s reversal to increasing sanctions on Russia, but giving up less than 0.5% hardly qualifies as an emotional rush for the exits. While the West is incrementally stepping up pressure on Russia, both sides are co-dependent on each other and it is unlikely either side will act rashly. While it was enough to make buyers think twice today, these developments are largely priced in and unlikely to pressure the market. But just because the Russia thing is old news doesn’t mean we cannot selloff for other reasons, namely typical supply and demand fluctuations. 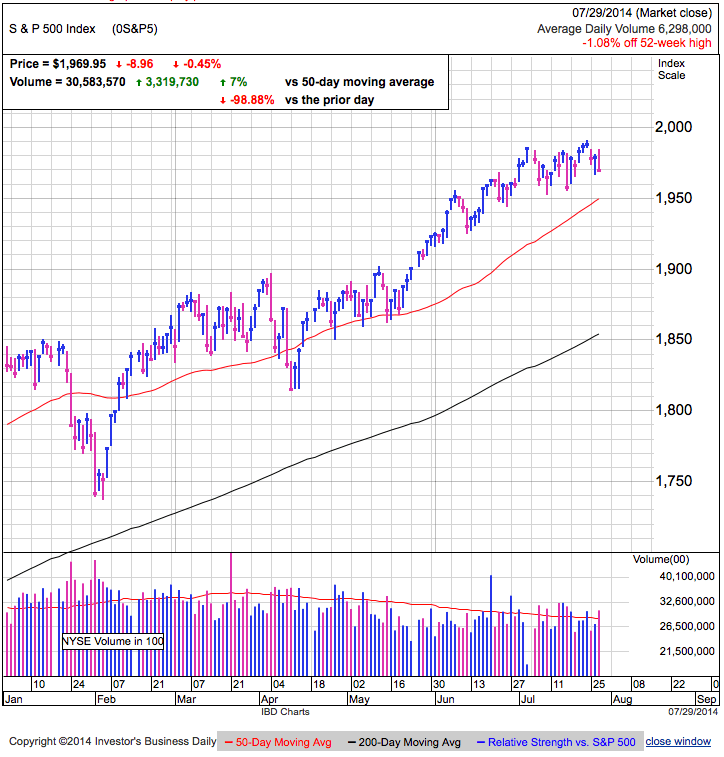 The market is building a trading ranged between 1,690 and 1,690 and no matter what the headlines, the market seems content hanging out in this area. 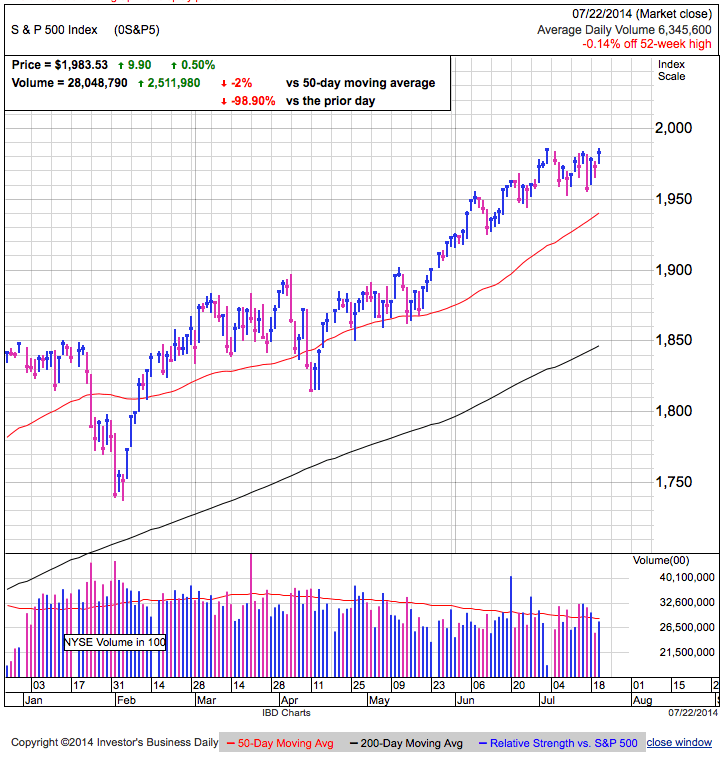 Prospective buyers are not confident enough to chase prices to new highs and owners are uninterested in selling bearish headlines for a discount. Apathetic buyers and complacent owners leaves us range bound. The longer we hold support, the more likely the next move will be higher. Markets tend to breakdown quickly and holding 1,960 for a month in the face of significant geopolitical headlines surely doesn’t qualify as a meltdown. If the market holds 1,960 yet again on Wednesday, expect us to make new highs again in the short-term. While owners are confident here, nothing shatters confidence like seeing everyone around them start selling. While a modest, intraday dip under 1,960 is nothing to worry about, if the selling accelerates after violating support, we have further to fall. If bulls cannot defend the 50dma and 1,950, then 1,900 and the 200dma are in play. We are in no man’s land. Those with long or short positions can stick with them, but use stops to prevent small losses from turning into big ones. Those outside the market should wait for further confirmation before placing a trade. Closing above 1,960 on Wednesday is bullish and crashing through it is bearish. Stocks recovered early losses to finish flat. Volume was below average, even by summer standards. Last week we failed to breakout; today we failed to breakdown. Seems those with cash don’t want to buy new highs and those with stock are uninterested in selling weakness. Until someone decides to do something we will continue trading sideways in this developing trading range between 1,960 and 1,990. Wile bears are pointing to a dozen different reasons we should selloff, the market already knows them and doesn’t care. Free-markets are exceptionally efficient at pricing in new information and events in Ukraine and Palestine are ancient news. While either of these situations could deteriorate dramatically, it would take something even more shocking than downing a civilian airliner to get the market’s attention. While there is little doubt this market will pullback at some point, the hard part is figuring out when. Some are making seemingly bold predictions of a 20% pullback in the next 12-months, but what happens if we go up 30% before the expected correction? Knowing what the market will do next is easy, getting the timing right is where all the money is made and a “sometime over the next 12-month” prediction isn’t worth the paper it’s written on. Given the opportunity to both breakout to new highs and test support in recent days, the market instead chose to do nothing. It seems like it wants to consolidate in this 1,960 to 1,990 trading range over the near-term. This morning’s bounce could be little more than an automatic buy-the-dip reflex, but if we are running out of dip buyers, the market will let us know when it fails to hold 1,960 support. The market is not giving us a lot to trade. Since we are still in an uptrend, we should give bulls the benefit of the doubt, but as far as risk/reward goes, it feels like a coin-toss and we should wait for better odds. 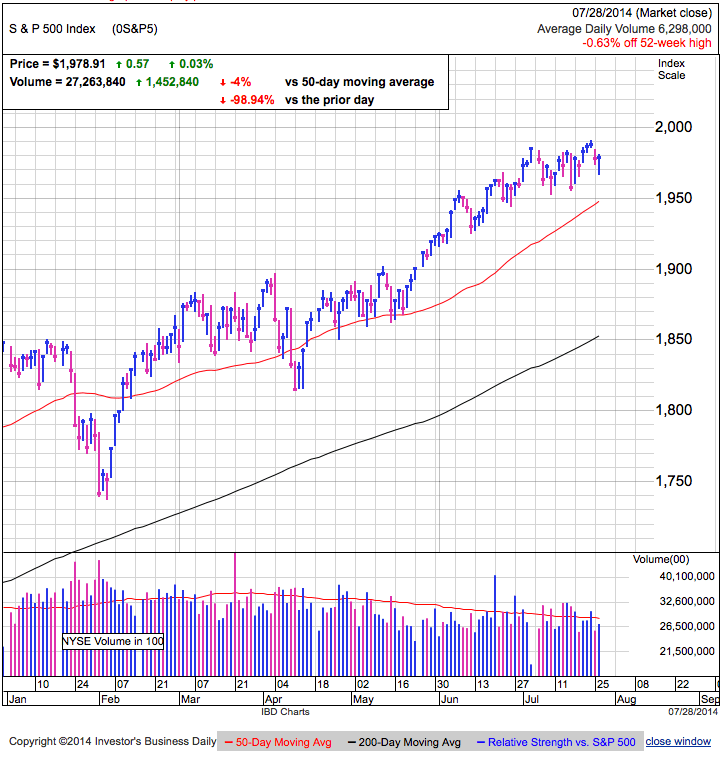 Stocks tested recent highs near 1,985, but failed to set a new closing high. The last few weeks of sideways trade allowed the rapidly rising 50dma to catch up and we are now less overbought than the last time we found ourselves up here. While we are back near the highs, market participants are far less giddy this time. Conflict in Israel and Ukraine are keeping traders on edge, but the truth is these headlines are already old news as far as the market is concerned. Anyone who fears these situations already sold. Those who bought during this uncertainty showed an appetite for risk and willingness to hold the volatility. And of course as we’ve seen in previous dips, the vast majority of owners have no interest in selling no matter what the headlines shout. While all the talking heads try to scare us with this or that, without sellers this market will continue to defy gravity. But that is the near-term assessment. Over longer time frames it is hard to think of the catalyst that will drive the next bull leg higher. Typically markets climb the proverbial wall of worry. This is when prices are oversold as traders fear the worst. Then there is a gradual thaw and markets rally as traders change their mind and slowly buy back in. But we find ourselves with the opposite condition, everyone is fat, dumb, and happy. With everyone so content, there are fewer and fewer people left to change their mind and buy in at ever higher prices. While the momentum is clearly higher, we are on thin ice. We are a few points from record highs and the resulting short-covering and breakout buying that will push us toward 2,000. After that, it is anyone’s guess what comes next. Maybe it is one last surge in a double top. Maybe we’ll pullback modestly and continue consolidating. Or will we surge higher and never look back? Only time will tell as we watch to see how traders respond to the breakout. Many traders expect us to hit 2,000, but often the market gives us the opposite of what the crowd expects. Today’s failed breakout could be all we get before retesting support at 1,950. It is too early to be short this market since it is completely ignoring bearish headlines. No matter what people think it should do, it keeps going higher and we must respect that. 1,950 is turning into a major technical support level and breaking through that will force us to reevaluate our outlook, but until then assume the uptrend is intact and plan your trades accordingly. Plan your trade; trade your plan. Stocks plunged on a double dose of international headlines. The S&P500 gave up more than 1%, making this the biggest selloff in multiple months. In spite of anxious selling, we are still above 1,950 support and curiously, the volume was the lowest we’ve seen in three days. Clearly this was a sell first, ask questions later kind of day, but the relatively light volume is noteworthy for such an outsized move. There are two ways to interpret this. Either there are still a lot of hopeful owners left to drive out of the market, or alternately, most owners are not interested in selling these headlines and today’s move was driven by a small minority impulsively reacting to headlines. As for the individual headlines, anyone paying attention over the last few years knows there are periodic flare-ups between Israel and the Palestinians and tensions have been coming to a head in recent days. This shouldn’t be a big surprise and it is unlikely to lead to a material disruption in the US economy or earnings for US listed equities. While these stories are never pleasant, we’ve been here before and few people will change their economic forecast based on these events. That means this headline is largely a non-issue for US markets. What happened in Ukraine is quite a bit different. Shooting down a civilian airliner is anything but routine and it clearly escalates the tension between the East and West. While many feel this will deteriorate the already fragile situation, I’ll take the other side. This tragedy could actually defuse things. If it turns out Russia or Pro-Russian separatists were involved, that creates an indefensible position for Putin and he will have little choice but to dial back his rhetoric. This was an appalling act and there is no way he can defend the people who pulled the trigger, killing nearly 300 innocent people. Putin could very well distance himself from the separatists following this cowardly act and without their major ally, their resistance will likely fizzle. But even if tensions remain elevated in Ukraine, the market came to terms with these risks months ago when the situation first developed. Honestly I think we should be more fearful of what is going on in Iraq than who fired the missile today. If the market doesn’t care about what is happening in Iraq, then this Ukraine story won’t matter in a couple of days either. While these clouds will likely pass once most traders realize they will have limited impact on corporate earnings, we could see near-term weakness as traders continue selling before thinking. But given how quickly the market blew off more serious headlines out of Iraq and Portugal, I doubt today’s weakness will last more than a couple of days and this creates yet another buying opportunity. The market has largely been ignoring escalating geopolitical risks. At some point hoping for the best will no longer work and we could be in the middle of that if the situation Israel and Ukraine continues to deteriorate. Support lies back at 1,950. While we might dip under this key level if selling continues early Friday, closing above it is supportive of this market. It tells us the wave of reactive selling has stalled and we likely have another buyable dip on our hands. But if we slice through 1,950 and keep going, all bets are off and a test of 1,920 support seems likely. Stocks closed above 1,980 for the first time in a couple of weeks, leaving us within a few points of all-time highs. 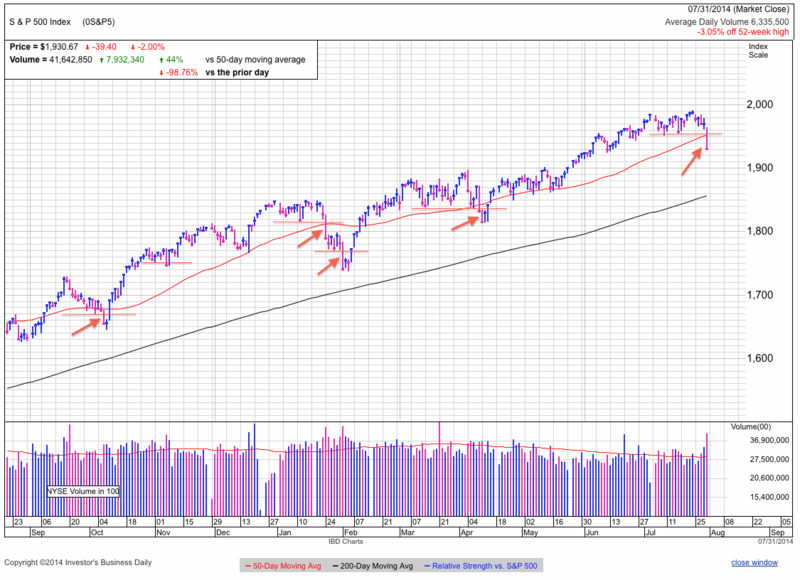 While the market trades sideways, the upward sloping 50dma and 200dma are quickly gaining ground. The market no one wants to trust keeps holding strong. Many traders admit they think stocks have come too far, but they are reluctant to sell because every time they sold over the last year and a half, they watched the market rebound higher without them. This is the foundation of the “next greater fool” theory in investing. The logic goes, “I know this is overvalued, but I will buy it anyway because I know someone else will come along later and pay even more for it.” Traders have a natural fear of heights, but this resilient bull market is making many are more afraid of being left behind than losing money. This is why so many continue chasing all-time highs and not selling bearish headlines, even though they don’t trust this market. But like every game of musical chairs, if you stick around too long, you’ll be the one that gets left out. We are four points from triggering another short-squeeze. While there is no reason to trust this market, it is giving us every indication it wants to go higher. Even if we are setting up a bearish double-top, we still need to set new highs first. At some point we will run out of dip-buyers. Maybe that day is tomorrow. Maybe it won’t happen until next year. But every dip that gets bought brings us one step closer to the one that doesn’t. Failure to set new highs this week will be an ominous sign. Both bulls and bears should expect new highs in coming days. The only disagreement will be what to do next. Bulls should use a trailing stop to protect recent profits. Bears should wait a couple of days before jumping in front of this bounce. 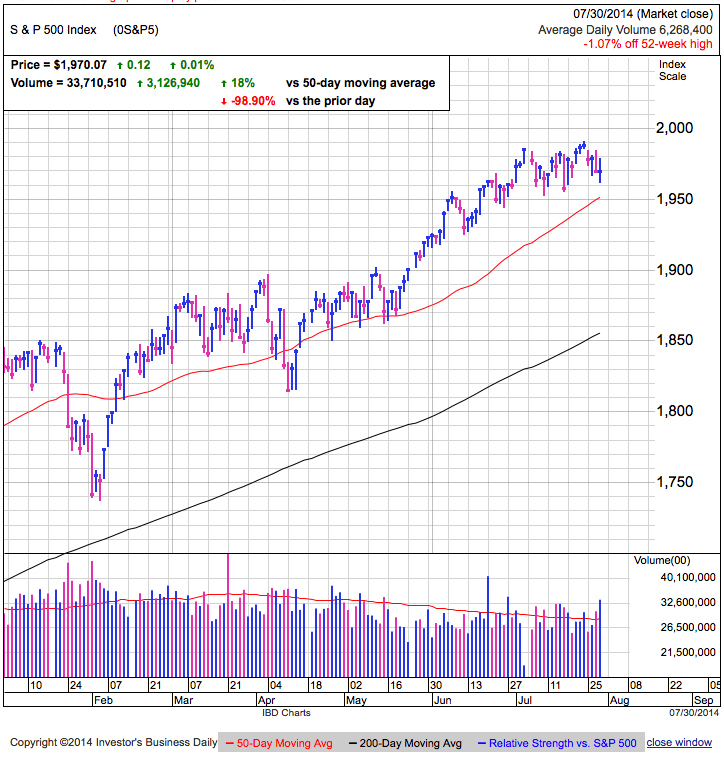 Stocks extended Thursday’s bounce off of 1,950 with modest gains on light volume. While not many traders participated this low-volume move higher, what is more important is confident owners chose not to sell the rebound. As long as owners are willing to hold no matter what the headlines proclaim, it is really hard for a correction to take hold without supply. And that is why, much to the chagrin of bears, this market continues to climb on weak volume in spite of all the ominous headlines. No supply means no selloff. While we all know this cannot go on forever and at some point this bull market will stall, the challenge is figuring out when. Predicting what the market will do is easy, all the money is made getting the timing right. While there are countless indicators pointing to how high investor sentiment is, in the near-term these indicators are bullish because it means people continue throwing money at the market. Only after we get too close to the sun will we finally come crashing back down to earth. Until then, let the good times roll. Selloffs are breathtakingly quick and this is the third day we’ve held 1,950 support, suggesting last week’s dip was little more than a test of support. While I’m no raging bull, this market is giving every indication it wants to test 2,000. One of these days we will come across a dip that shouldn’t be bought. While the final score might be 99-1, bears will ultimately have the last laugh. Last week’s selloff appears dead and bears should cover shorts before they turn into losses. Nimble short-term traders can position themselves for a short-squeeze to 2,000. Long-term investors already in the market should stay in the market but hold off on making new purchases for a couple of months because we will likely see better prices. Stocks gapped lower at the open on renewed European banking worries, but recovered a big chunk of those losses by the close. Volume was elevated as fundamental traders responded to the headlines and technical traders bailed on the break under 1,960 support. 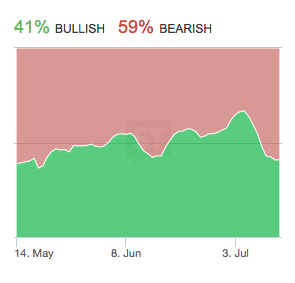 While the S&P500 closed down 0.4%, this was about as bullish of a day as we could ask for. Between the scary headlines and a violating support, owners had every excuse to stampede for the exits. Instead they did the opposite, absolutely nothing. The lack of selling tightened supply and there was nowhere for this market to go but higher from the opening lows. When the market doesn’t do what it is supposed to do, that is a clear indication our analysis is flawed. Bears had the perfect setup for a cascading selloff between spooky headlines and technical weakness, but when most owners didn’t flinch, it shows bears under estimated the resolve and confidence of bulls. Even more bullish is the fact that over the last several days many weak-kneed traders sold these down-days, leaving far fewer potential sellers in the market. Those that bought the dip demonstrated a willingness to own in the face of this weakness and are unlikely to flinch if we see another modest dip. But a peculiar thing happens when everyone is willing to hold another dip, we don’t get one because when no one sells, there is nothing to push the market down. Having chased most of the worry-worts out over the last few days sets up a solid foundation of confident owners from which to continue the prior up-trend. While this rally will eventually end like every rally before it, when the market resists the perfect setup to selloff, it means the rally is not over. Buy the dip is the most worn out trade of the last few years. By the time everyone know something, it is already on its way out. If we bounced on one last gasp of dip-buying, expect the selling to resume once the dip-buyers run out of money. 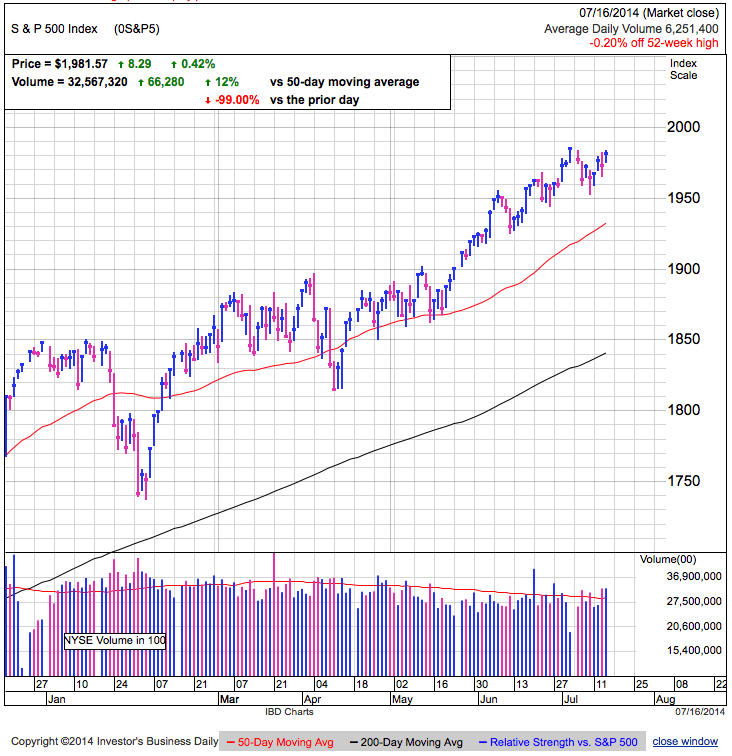 The market is giving every indication it wants to go higher in the short-term. Dip-buyers can buy the dip and bears should lock-in any profits they have before they disappear. If we undercut today’s 1,952 low, all bets are off and the selloff will likely continue.